Bank holiday Monday saw the Royal Regiment of Fusiliers Band ( Lancs) leaving their base in Bury and heading south for a short tour of Belgium. 25 members of the band and 8 supporters travelled to their hotel Ostend to start the five day visit. Events included playing in the Market Square in Bruges, followed by plenty of time for sightseeing. The following day the band performed in the square outside the Cloth Hall and In Flanders Museum in Ypres. A highlight for the band was participation in the poignant Menin Gate Last Post Ceremony. The Memorial commemorates the names of over 54,000 officers and men of the United Kingdom and Commonwealth Forces who died in the Ypres Salient before 16th August 1917 and who have no known grave. From 11th November, 1929 the Last Post has been sounded at the Menin Gate Memorial every night and in all weathers. The only exception to this was during the four years of the German occupation of Ypres from 20th May 1940 to 6th September 1944. 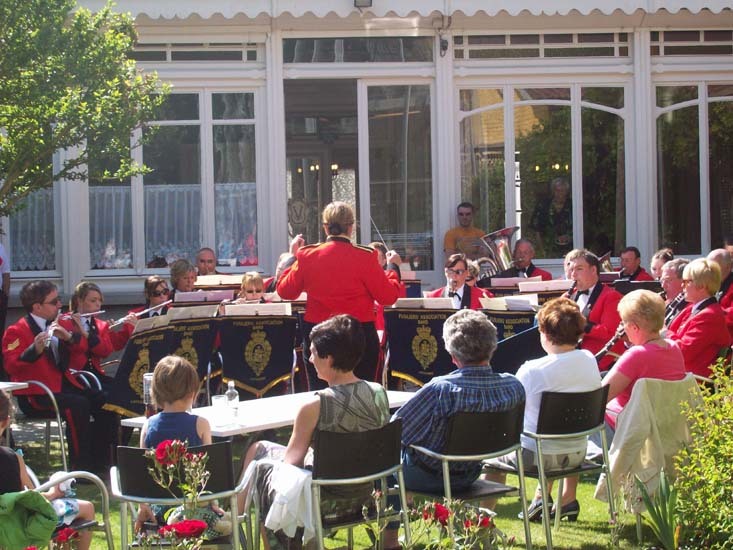 The final day saw the band well-received by local people and visitors to Talbot House (TOC H) in Poperinge which was used as a british soldier's club during the first world war. It became a rare place where soldiers could meet and relax regardless of rank. The tour finished with an emotional laying of two wreaths at Prowse Point Cemetery where the remains of men whose bodies have been discovered in recent times in or near the Ploegsteert Wood have been reburied. One was Private Harry Wilkinson of the 2nd Lancashire Fusiliers. His body was found in 2000, and he was reburied here in 2001 with full honours. The other was Private Richard Lancaster who, like Harry Wilkinson, served with the 2nd Lancashire Fusiliers and also died on the 10th of November 1914, his body not found until 2006.